The Fall 2018 issue of Easy Quilts magazine featured two different quilts made by designers Joanie Holton and Melanie Greseth using Kanvas fabric collections. They're both done in varying shades of purple, and they're two totally different looks! Take a look at both and leave a comment letting us know which one catches your eye! 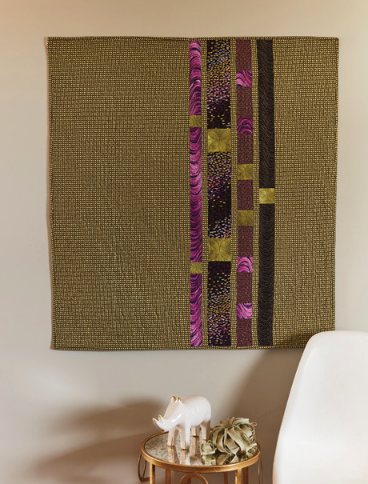 Midnight Wind Chimes is an art quilt--a quick-to-stitch wall hanging featuring the elegant and dramatic Pansy Noir collection. 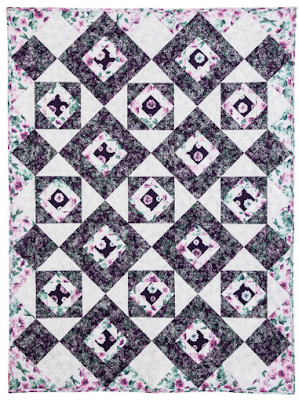 Tell us about this quilt design. We wanted something different—a wall hanging that was a piece of art. 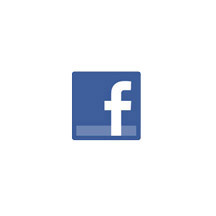 We took a minimalist approach with the design, to give it a modern feel. This is a very accessible quilt for a beginner to put together. What attracted you to the Pansy Noir collection? The metallic aspect is so strong in the fabrics, and we wanted to create a design that would reflect that. It was really fun to play with these more contemporary prints! We went through a lot of options! We started with the tonal prints in the collection, but realized that we needed something more eye catching. The metallic gold in this print, as well as the tight design, adds a dramatic feel to the quilt. We used the same print for the binding so the quilt didn’t have a framed effect. Was it fun deciding on the fabrics for the pieced strips? It was! We wanted to find a way to use the beautiful prints without overpowering the quilt. The waves are fun to use—we love how the purple waves look. And the butterfly print is so different—we fussy cut it to highlight different areas of the print. Even though it’s a small quilt, the longer you look at it, the more details you notice. It’s very artsy to me. Click here to see the entire Pansy Noir collection. Click here to see more from Melanie and Joanie. Click here to find the kit for Midnight Wind Chimes. 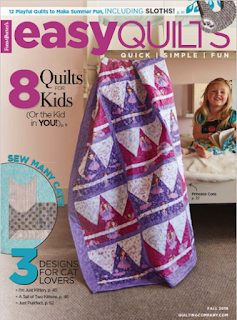 Click here to find Easy Quilts Fall 2018. 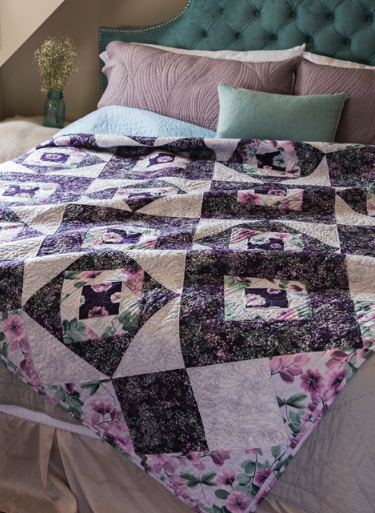 "Freshwater Pearls" uses the plum colorway of the Essence of Pearl collection and combines two classic quilt blocks into a unique pattern. It’s really easy to pass over traditional blocks for new designs. You see them always in the same layout. We challenged ourselves to figure out a new way to use some very traditional blocks. The color placement of the darker plum fabric creates a floating appearance for the square in a square. Can you talk about how you used the large floral print in this design? So often a large floral is the focal point, but we chose to focus on the darker plum in the blocks. We used the floral as more of a background, so it creates dimension without overpowering the design. I think it creates a wispy feel. What attracted you to the Essence of Pearl prints? Definitely the unique palette. That dark plum color really drew me in. It’s so dramatic! I like how the dark plum changes the perspective of the blocks. It creates a new pattern and I like how it looks. Click here to find the Freshwater Pearls pattern. I prefer "Freshwater Pearls" because of it's traditional design. I love the Pansy Noir collection and don't feel that "Midnight Wind Chimes" does it justice. 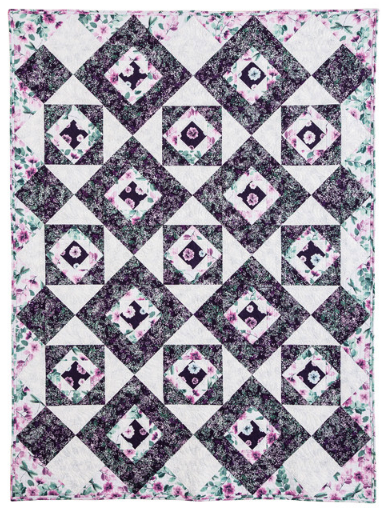 Love the Midnight Wind Chimes quilt. What print was used for the background? It looks like a solid to me, with closely spaced vertical and horizontal straight line quilting. I tried enlarging the picture but still don't see a print in the background fabric. I really love Midnight Wind Chimes. I can see inspiration for another quilt in my future. Thank you. I prefer traditional quilts, but I found myself coming back to Midnight Wind Chimes over and over. That said, I can’t wait to see the Essence of Pearl collection in person...somewhere.